The Italian Greyhound is a super elegant, handy and lovable companion dog. Weighing in just under 5 Kg it is the smallest of the Sighthounds, but whatever the breed may lack in size is more than compensated in self-esteem and charm! Some of the special characteristics of the breed are their devotion to their family. They are infinitely gentle and would never show signs of aggressiveness. The Italian Greyhound is a vivacious dog with lots of good spirit and a twinkle in the eye. Curious and eager to follow the owner around in the house as well as outside the house as called for by the daily routine. Not to mention that this is a very good way to stay in the centre of the family focus. Despite the aforementioned vivaciousness another characteristic of the breed is the desire to sleep cuddled up under a blanket! They simply love a warm and soft blanket as a cover. Should the weather then be rainy and cold an Italian Greyhound will stay hidden under the blanket for ages in order to avoid drawing attention – and a walkie - from the owner. On the other hand it will be impossible to ignore the desire for a walkie once the weather is fair. If you have kids and especially smaller kids and are facing the challenge of having to select the family’s next dog you should carefully consider the following before choosing an Italian Greyhound. Not that the Italian Greyhound in any way would think of showing aggressiveness towards children – something unthinkable for these gentle dogs – but the dog could end out being the loser in such a setup. 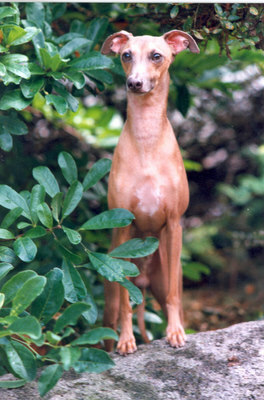 The Italian Greyhound is fast and has great jumping power and may hurt itself if it for example is challenged in jumping down from a high altitude. Nor is it particularly well suited for joining in a soccer tournament in the garden due to the temper and the bone structure. The upbringing of your own kids is quite often not enough. Once the kids bring their playmates home remembering and adhering to the rules laid down is quite another thing. But, if the will is there to put in the extra effort needed the family will get a devoted and loving family dog. 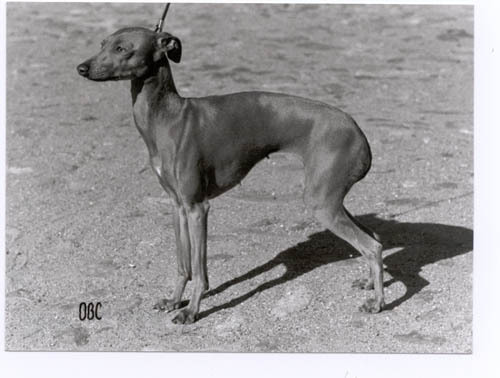 The Italian Greyhound has great speed and jumping power due to its construction. While still young (< 2 years) it has not yet developed a sense of its own limitations. It can with the greatest of ease jump up on furniture etc., but without having a sense of judging distances it is easy to miscalculate the jump down and thus inflicting damage on the legs. 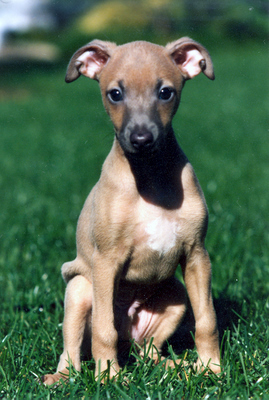 An Italian Greyhound should therefore be taught the vital rules for”good behaviour” whilst being young/a puppy. Should you ever come across a dog sitting in a high position approach it carefully and lift it down quietly. Yelling and quick movements will only make jump down on its own. The Italian Greyhound loves running freely and running together with a playmate. But, the playmate should be of the same size or smaller or there is a risk that the Italian Greyhound will get injured. We are often asked if the dog is allergy friendly. There is no scientific evidence in support of this apart from the fact, that the dog is small and short haired. It scales and loses hair as every other dog. Are you allergic to dogs your MD will no doubt advise against acquiring any kind of dog – including an IG. The people we know who are allergic to dogs react to even a short visit by an IG.